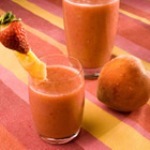 In a blender, combine strawberries, banana and peaches. Blend until fruit is pureed. Add ice and blend to desired consistency. 1) In a large bowl, combine all of the ingredients and stir till the dough starts to leave the sides of the bowl. Transfer the dough to a lightly greased surface, oil your hands, and knead it for 6 to 8 minutes, or until it begins to become smooth and supple. (You may also knead this dough in an electric mixer or food processor, or in a bread machine programmed for “dough” or “manual.”) Note: This dough should be soft, yet still firm enough to knead. Adjust its consistency with additional water or flour, if necessary. 5) Remove the bread from the oven, and turn it out of the pan onto a rack to cool. 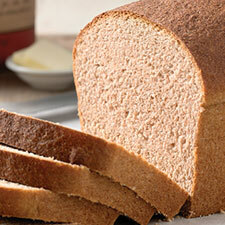 If desired, rub the crust with a stick of butter; this will yield a soft, flavorful crust. Cool completely before slicing. Store the bread in a plastic bag at room temperature. In a medium bowl, mix the dry ingredients and blend in all the wet ingredients. Heat griddle with medium heat. 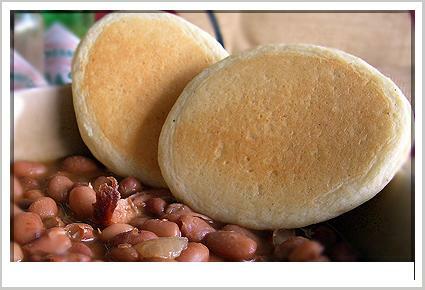 Pour about a 1/4 cup of batter onto griddle and cook 1 1/2 – 2 minutes, then flip. Cook another minute until golden brown on both side. Just like when you’re making regular pancakes. Serve hot with butter, next to your favorite soup, beans or chili. Heat oven to 350°F. Combine 3/4 cup granulated sugar, flour, 1/4 cup cocoa, baking powder and salt. Stir in milk, butter and vanilla; beat until smooth. Pour batter into ungreased 9-inch square baking pan. 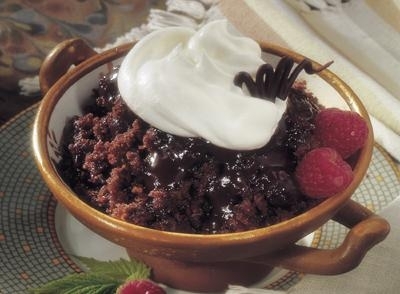 Stir together remaining 1/2 cup granulated sugar, brown sugar and remaining 1/4 cup cocoa; sprinkle mixture evenly over batter. Pour hot water over top; do not stir. Bake 35 to 40 minutes or until center is almost set. Remove from oven; let stand 15 minutes. Serve in dessert dishes, spooning sauce from bottom of pan over top. Garnish with whipped topping. 1. Cook bacon and sausage. Crumble into pieces. 2. Add butter, onion and hash browns. 3. Cook until done. Do not brown the hash browns. 4. Add eggs. Season to taste. Cook until egg whites are solid. 5. To make sauce: Heat green chili to boiling. Add chicken buillion. Make a roux with flour and milk and mix well. Pour into green chili. Add water if it gets too thick. Once it has reach gravy consistency, add cheese. 7. 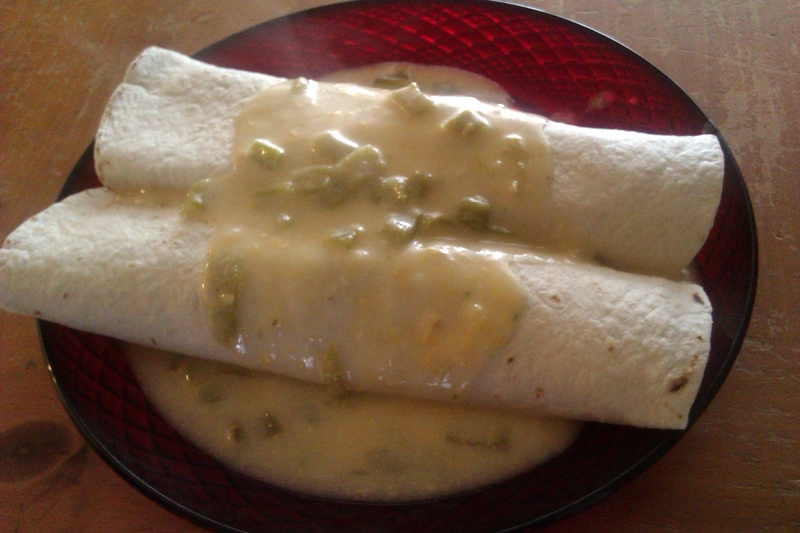 Put egg mixture into tortillas and roll. Pour gravy over the top. Enjoy! This recipe was found in the 1986 cookbook, I Hear America Cooking. These “little pies” are a version of those pastries made in Arizona & New Mexico, especially during Pueblo feast days. FOR THE FILLING: In a saucepan, put apricots in cold water & simmer gently until fruit is soft, about 30 minutes, then drain. In a food processor or blender, puree the apricots, then return the puree to the saucepan, add the brown sugar & cook until puree is very thick, about 8-10 minutes. Remove puree from heat, then add raisins & nuts, & set aside to cool. FOR THE DOUGH: While the puree is cooling, in a medium bowl, whisk together the flour, baking powder & salt, then cut in the butter & shortening until pea-size pieces form. Add just enough ice water, 1 tablespoon at a time, to make the flour stick together, then shape into a flattened ball, wrap in plastic & refrigerate for 30 minutes. When the dough is ready, preheat the oven to 400 degrees F, then cut the flattened ball in half & roll one of the halves out on a GREASED baking sheet. Spread the fruit mixture on top, ALMOST to the edge. Roll out the second half of the dough large enough to cover the fruit mixture, then place it on top, before pressing the edges together all around to seal. In a small container, whisk together the 1/3 cup of sugar & 1/2 teaspoon of cinnamon, then sprinkle that on top of the prepared pastry. Finally, with the blunt edge of a table knife, mark the pastry into small squares & prick each square with a fork ~ There should be about 30 small squares marked off. Bake about 20 minutes, or until pastry is lightly browned, then cool & cut into the marked squares.